If you like your gourmet chocolates with a crunch, then explore here to your heart's content. Dorothy's Candies features the very best in chocolate nibbles like malted balls, bridge mix, espresso beans, peanuts, and more. 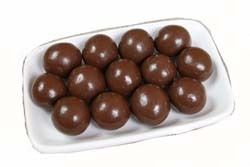 We also carry an array of malt balls in seasonal flavors and colors -- like pumpkin and red and green. Also look for occasional special treats such as chocolate-covered ginger (also found in Dorothy's Candies in the creamy variety), and fruit and nuts varieties. All Dorothy's panned chocolates come packaged in elegant gold bags with tiny bows -- ready for gifting or eating. Enjoy.